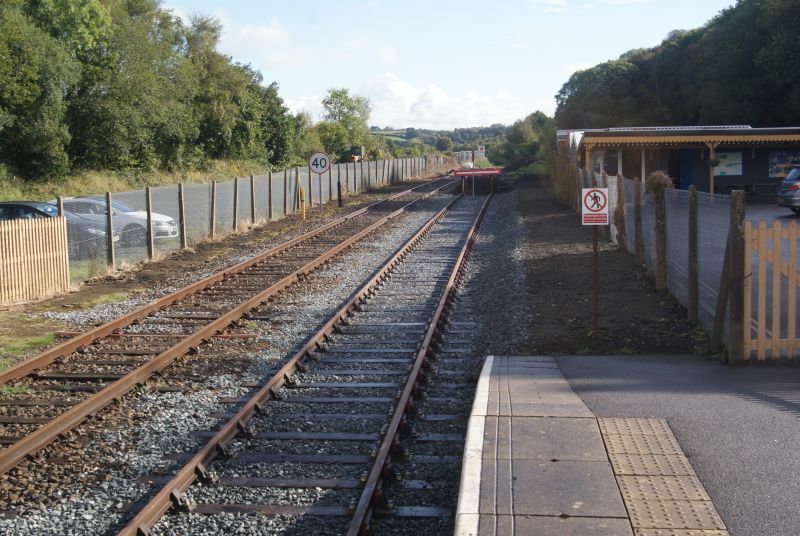 One of the enhancements planned for the railway in 2016 is an extension to the Okehampton Platform 2 siding, with associated signalling changes. This will make it easier to accommodate the Polar Express, and allow the Meldon shuttle to be stabled at Okehampton. We hope to be able to publish fuller technical details in due course. It is hoped that DRSA volunteers will be able to assist DR/RMS Locotec staff as much as possible as the project progresses. Future working dates will be published as soon as we have them. For details contact our Volunteer Coordinator Geoff Horner on 01363 82383 or email volunteering@dartmoor-railway-sa.org. Updates are shown below with the latest first. The first train into the newly extended siding was 47828 with the Polar Express stock. Julian Pope's first solo flight. The RMS team at work with the Wickham and the digger. A couple of images of the latest state of play from Paul Martin. 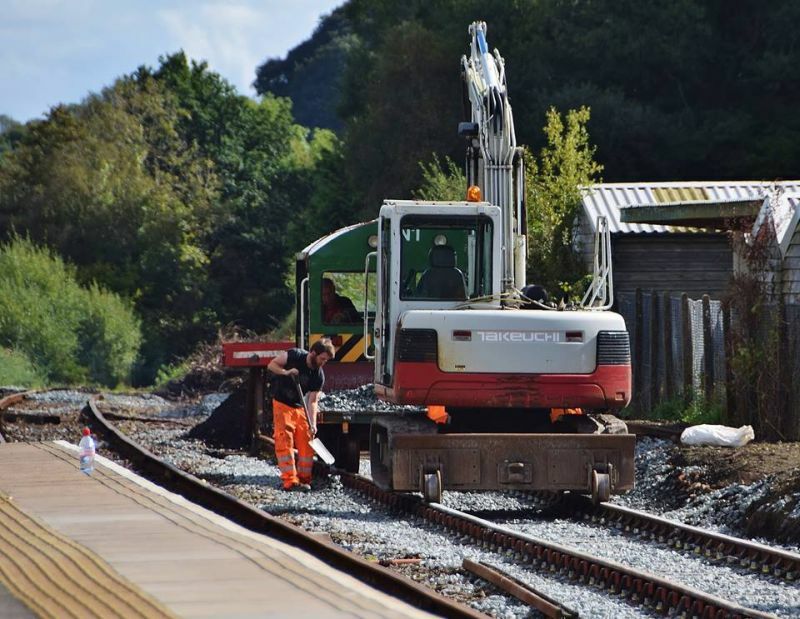 When was the last time you saw new track laid on the Dartmoor Railway? The first load of ballast is now in place, with more on the way. It came from Aggregate Industry's Greystone Quarry near Launceston. What a shame it couldn't come from Meldon. Further progress is apparent, and track laying will start soon. New sleepers at the ready. The water is from a natural spring which normally flows harmlessly through the formation. Whilst a group of DRSA volunteers was attending a Personal Track Safety course, the RMS Locotec team was at work with the digger levelling the track bed. The buffer stop has been removed and trains are terminating near the footbridge. Alistair Gregory reports that 'Stage 1' is now complete. When the layout is pegged out, track laying will get under way and there will be further opportunities for volunteers to get involved. Clearly someone was busy with a digger earlier in the week, as the following photos show. The current state of the work site. The siding will extend to roughly where the stop board is just visible, but as it has to be level it will be a couple of metres above the height of the running line at that point. A few photos taken at the end of the first week give an impression of the extent of the site. Some of the unearthed rails have already been removed to Meldon. Others can be seen awaiting collection. Somewhere in there is the single slip junction visible in old photos of Okehampton. Work got underway on the 13th as vegetation clearance was carried out by a joint team of DR/RMS staff and DRSA volunteers. A late decision was made to make use of 47828 and the Sturgeon (bogie rail/sleeper wagon) and with the assistance of the road-rail digger, after nearly 20 years in the undergrowth switch and crossing materials were removed and loaded, along with a discarded caterpillar track. The following day the RMS crew made further progress, and it is hoped that all the trackwork should be ready for removal shortly. This will allow access with the digger to re-grade the area as it needs to be level with the old retaining wall some height above the running line. One of the DRSA volunteers was Tony Hill, who sent in the following pictures. From left: Alistair Gregory with volunteers Chris Spencer and Paul Martin. Also at work, with a strimmer, was a member of the RMS Locotec team based on the DR, principally for on track maintenance.